Are You An Endurance Athlete? Prepare To Have Your Day Ruined. To everyone who thinks that training for a marathon means being able to cram your face with any and as much food you damn well please – we have some unfortunate news for you. 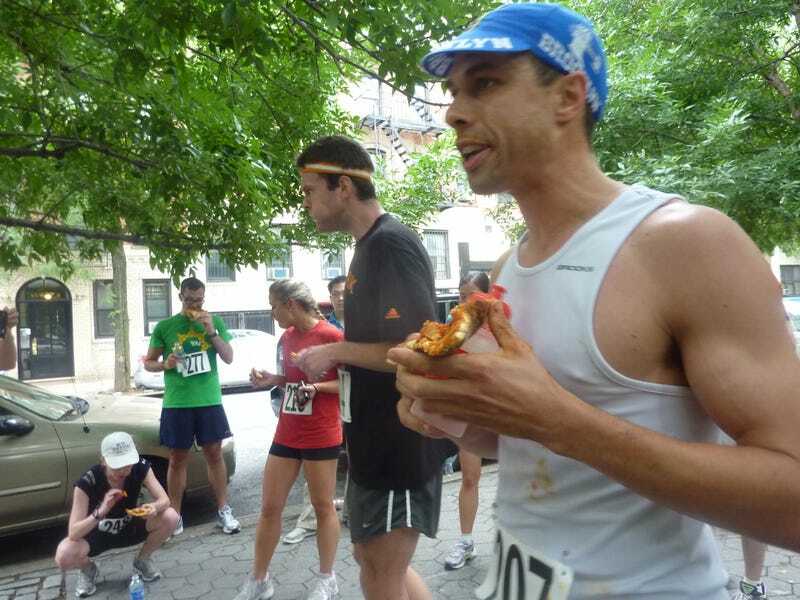 Above: Runners indulge in pizza during the 2011 NYC Pizza Run. A small body of research suggests that heart problems may arise not in spite of extreme-endurance exercise but because of it. That has led some cardiologists to theorize that, beyond a certain point, exercise stops preventing and starts causing heart disease. ...found that 50 men who had run at least one marathon a year for 25 years had higher levels of coronary-artery plaque than a control group of sedentary men. A British Medical Journal study published this year compared the carotid arteries of 42 Boston Marathon qualifiers with their much-less active spouses. "We hypothesized that the runners would have a more favourable atherosclerotic risk profile," says the article. As it turned out, that hypothesis was wrong. So just to reiterate: If you're an endurance athlete, it may not be your training that's doing your heart in, but there's a chance that something in your routine is. One explanation, cardiologists agree, could be the tendency for endurance athletes to meet their formidable caloric needs with nutritionally barren (or flat-out unhealthy) foods. "I'll burn it off" is the mantra – and, heart doctors say, the excuse – of many an endurance athlete. If you regularly indulge in post-race pizza, or a post-workout milkshake, it might be worth consulting with a cardiologist about the status of your heart. Read more at the WSJ. Read the study on the cardiac health of fifty veteran marathoners in Missouri Medicine.